Years ago, I was sick at home with a cold.. E came home with a gift for me.. He didn’t bring me flowers but he brought me a gardening book… A gift that keeps giving for someone like me…. I still look at it and am reminded of how he really understands me. So this is what was going on in front of our house this morning. These pictures were taken at 1030 am… It looks like an August morning, doesn’t it? No snow on the local mountains…The fish boats zigzagged in front of us for a couple of hours and tonight are on the other side of the island… There is lots of eagle chatter but no sign of the sea lions…. so is it herring time or not??? 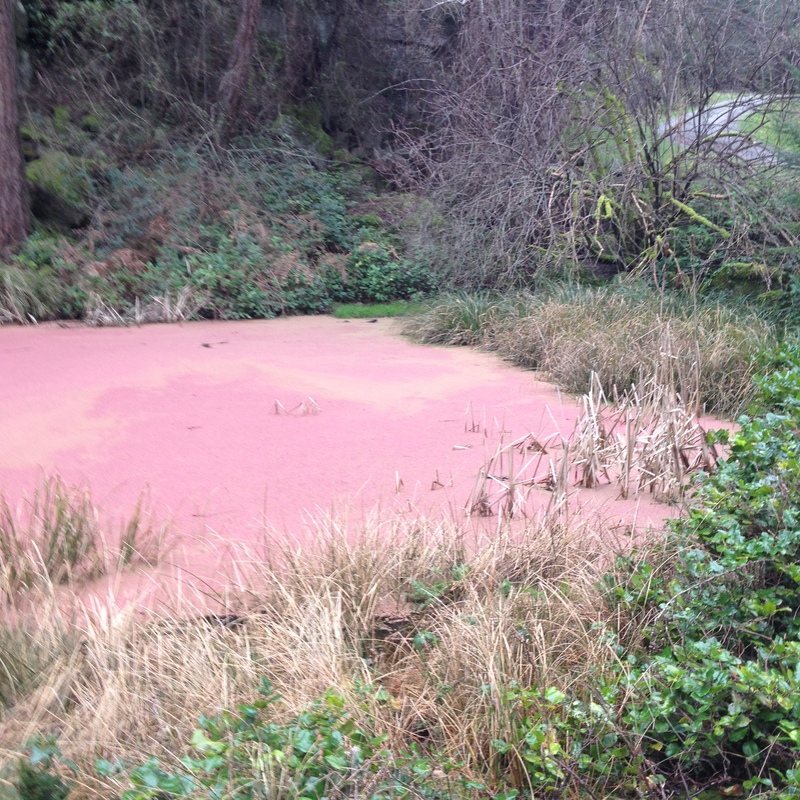 The pond at the end of our lane has turned red this winter. As previously discussed I was too busy playing bridge in high school to attend biology. I am figuring there are those of you out there who know way more about these things than I do… If any of you bright spots would like to share your knowledge I would appreciate it. What is causing it? What is it called? Is it a bad thing??? We picked up another tub of beach pebbles for the garden.. Maybe one more and then we will be set.. I am thrilled with how the path in the garden is turning out.